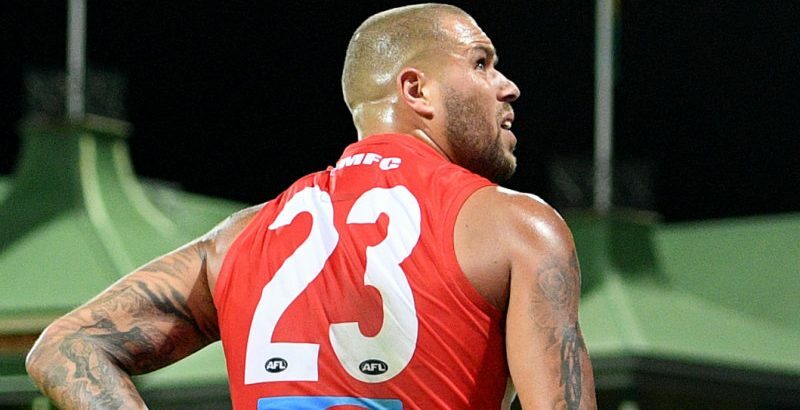 Criticism of Lance Franklin's performance against Melbourne as "selfish" is wide of the mark, according to Sydney coach John Longmire, who says the superstar forward was only guilty of trying too hard to swing the match. Franklin was below his best in Thursday night's 22-point defeat, kicking 1.3 and making several poor decisions in choosing to take low-percentage shots on goal when he could have passed to a teammate. It prompted former Richmond and Western Bulldogs coach Terry Wallace to describe it as "one of the more selfish games" he'd seen him play. Longmire leapt to his star forward's defence on Monday, saying his capacity to bring other players into the game was never in question. "He was just wanting to win," he said. "In the end, as all players do, you make some decisions that you'd like to look back on and do again. It's as simple as that I think. "He just needed to understand – as all of us – the harder you try, sometimes the worse it can get. You've just got to make sure you do it the right way. I'm more than happy with Lance, he's an absolute team-first player." Longmire said it was important the rest of the Swans team did their bit by taking some of the pressure off Franklin, who is perhaps overly burdened by his ability to shift momentum through his own freakish brilliance. Franklin, 32, could soon have some much-needed company in that regard. Geelong recruit Daniel Menzel, who Sydney picked up as a delisted free agent in the off-season, is nearing a return to full fitness after a series of groin struggles and could be given a run in the NEAFL in the coming weeks before an eventual AFL call-up. The Swans are in desperate need of more forward 50 options after losing Will Hayward to a broken jaw and Menzel – who kicked 136 goals in 73 games for the Cats – fits the bill perfectly as a handy foil for Franklin. But Longmire believes Sydney's problems start much further up the field. He said his coaching staff will look to tweak their structure around stoppages ahead of Saturday's clash with Richmond, admitting they were bleeding far too many scores from that source and giving away too many free kicks. "We're giving the ball back to the opposition far too easily, getting beaten to the loose balls, that means scores against have been not where we want them to be," he said. "We need to get that right so we can get the ball in our hands and get it forward – even though we're higher on inside 50s this year than what we were last year." Richmond are heavily depleted by injury but beat Port Adelaide in a thriller at the weekend and will welcome back Dustin Martin from suspension against the Swans. Longmire said they'd consider assigning a tagger to Martin, having watched how well GWS midfielder Matthew de Boer did in shutting him down. Another "bits and pieces" performance, as Longmire put it, will have dire consequences for Sydney (1-3) given how good the Tigers looked. "They were fantastic – down on personnel, playing away, got their trademark pressure game right up and going," Longmire said. "That stood out, they were just hunting and running in packs and getting after the opposition which is what good teams do. They certainly got after it and played a strong, aggressive brand of footy." « Premier League title race: Who has the best fixtures in the run-in – Man City or Liverpool?